People walking on the incline. 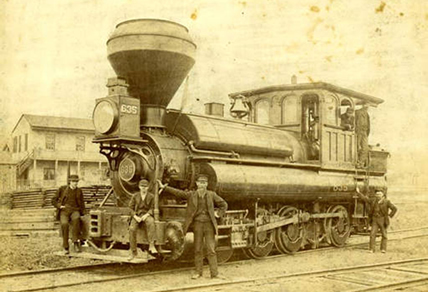 The Madison, Indianapolis & Lafayette Railroad dates back to 1836, when Indiana legislators included it as part of the Internal Improvement Act. It was the State’s first railroad, running 20 miles between Madison and North Vernon. Eventually the line would extend to Indianapolis. The part of the tracks known as “the incline” or “the cut” begins north of the intersection of West Main and McIntire Streets, where a historic marker has been erected to commemorate the incline, and ends at about where State Road 7 meets Terrace Drive on the hilltop. It covers a distance of 7,012 feet rising 412 feet in elevation to achieve a grade of 5.89 per cent, the steepest incline of any standard gage, line-haul railroad track in the country. Mostly Irish laborers built the incline over the course of five years. Under a thin layer of topsoil, workers had to contend with 40 to 125 feet of limestone, which were first blasted with powder and then excavated by laborers. Irish immigrant William Griffin, who came to Madison in 1837, supervised construction. The first trip up the incline occurred November 3, 1841. The train’s passengers included former governor Noah Noble, who had been at the State’s head when the Internal Improvement Act was signed in 1836. For several years, horses pulled train cars up the incline, as there was no engine powerful enough for that task. About 1848, a cog wheel system was implemented, allowing specially fitted engines to climb the hill, though laboriously. This mode of ascension was abandoned in 1868, when the engine Reuben Wells was created. Named for its maker, this 56-ton engine was heavy enough to cling to the tracks without the assistance of cogs. All three of these mechanisms would stop at the top of the hill, where cars would be transferred to a standard train engine. The Reuben Wells is currently on display at the Children’s Museum of Indianapolis. While the incline cut helped connect towns along the railroad line to Madison and the city’s Ohio River traffic, it also offered a new, unexpected opportunity for recreation. During the 19th century, Madison residents looking for a thrill would take leisurely walks along the tracks and hike through the cut during periods of low rail traffic. 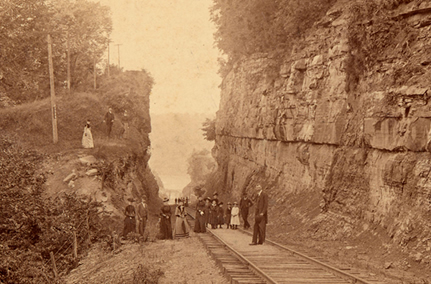 Nineteenth-century photographs show groups of Madisonians dressed in their Sunday best traipsing between the incline cut’s steep rock faces. The Madison Railroad Incline Cut is located north of Madison. The part of the tracks known as “the incline” or “the cut” begins north of the intersection of West Main and McIntire Sts, where a historic marker has been erected to commemorate the incline, and ends at about where State Rd. 7 meets Terrace Dr. on the hilltop. The Madison Heritage Trail follows the historic Madison and Indianapolis Railroad tracks partially up the hillside and includes a view of a stone arch culvert under the lower section of the incline. For more information, visit the Heritage Trail Facebook page.